A fairy ring mushroom up close and personal in our front yard. 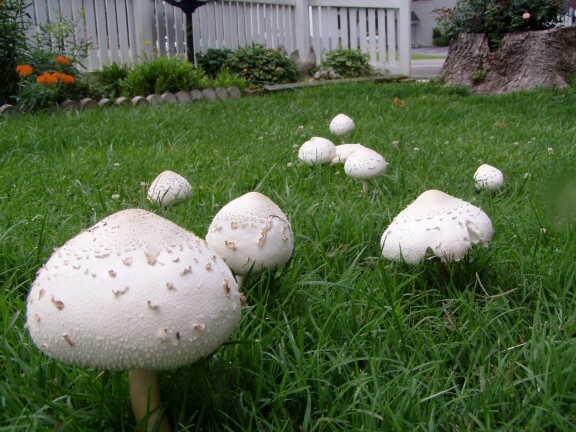 There are about 40 to 60 mushroom species that grow in what is known as a fairy ring pattern. One of the largest rings every found is in France and is thought to be over 700 years old. A fairy ring, also known as fairy circle, elf circle or pixie ring, is a naturally occurring ring of mushrooms. Fairy rings also occupy a prominent place in European folklore as the location into elfin kingdoms or places where elves gather and dance. A great deal of folklore surrounds fairy rings. In France, they are known as "sorcerers’ rings," and in German tradition, fairy rings were thought to mark the site of witches dancing, while the Dutch superstition claims that the circles show where the devil set his milk churn. In Tyrol, folklore attributed fairy rings to the fiery tales of flying dragons. Once a dragon had created such a circle, nothing but toadstools could grow there for seven years. European superstitions routinely warned against entering a fairy ring. French tradition reported that fairy rings were guarded by giant bug-eyed toads that cursed those who violated the circles. In other parts of Europe, entering a fairy ring would result in the loss of any eye. Scandinavian and Celtic traditions claimed that fairy rings are the result of elves or fairies dancing. Such ideas dated to at least the mediaeval period. 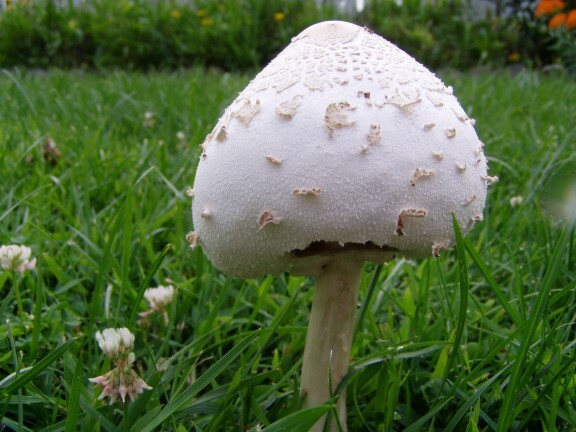 A Scottish resident believes that fairies sit on the mushrooms and use them as dinner tables. A Welsh woman claimed that fairies used the mushrooms as parasols and umbrellas. An Irish legend tells how a farmer built a barn on a fairy ring despite the protests of his neighbors. He is struck senseless one night, and a local "fairy doctor" has to break the curse. The farmer said he dreamed that he must destroy the barn. Even collecting dew from the grass or flowers of a fairy ring can bring bad luck. Destroying a fair ring is unlucky and is fruitless. Superstition says it will just grow back. Numerous legends focus on mortals entering a fairy ring and the consequences. One superstition is that anyone who steps into an empty fairy ring will die at a young age. Most often, someone who violates a fairy perimeter becomes invisible to mortals outside and may find it impossible to leave the circle. Often, the fairies force the mortal to dance to the point of exhaustion, death, or madness. Some legends say that if mountain sheep eat the grass of a fairy ring, they will flourish and that crops sown from such a place will prove more bountiful that those from normal land. Another folk belief claims that a house built on a fair circle will bring prosperity to its inhabitants. Celtic legends often tell that the only safe way to investigate a fairy ring is to run around it nine times. This affords the ability to hear the fairies dancing and frolicking underground. According to a 20th century tradition of Northumberland, this must be done under a full moon, and the runner must travel in the direction of the sun. To circle the ring a tenth time is foolhardy and dangerous. Another superstition says that wearing a hat backwards can confuse the fairies and prevent them from pulling the wearer into their ring. Superstition calls fairy circles sacred and warns against violating them lest an "interloper" (such as a farm with a plow) anger the fairies and be cursed. A tale was told about a farmer who tied a rope around himself and enlisted four men to pull him from the circle as he went in to save his daughter who had disappeared inside a circle. The rescue could not take place until a year and a day had passed from the point where the daughter entered the ring. Or you'll break a fairy spell. It’s interesting what questions come to mind after reading about this type of mushroom, especially in light of the fact that it’s time to mow the yard. In the past, no one gave a second thought the mowing these mushrooms down, but now we’re wondering. Do you suppose Shakespeare would advise us to mow around the mushrooms, or would he tell us not to mow that part of the yard at all? If you look over the fence at our yard a few weeks from now and the grass on one side is waist high, you’ll know we decided not to take any chances. I don’t think that dancing in a circle for a year and a day while waiting to be rescued would make a whole of sense for not showing up at work. I just hope I’m not already in trouble with the fairies in our front yard for writing this about them. These fairy ring mushrooms in our front yard aren't growing in the typical circle as they are most often found.